Hello Friends, do you want to apply for UPPCL Recruitment 2019? If yes, then here is a good opportunity for you. 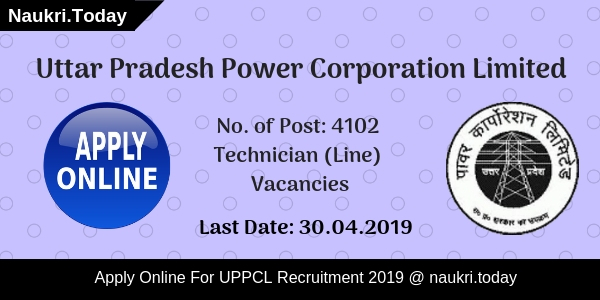 Uttar Pradesh Power Corporation Limited is inviting applications for 4102 Technician (Line) Post. Interested & eligible candidates can apply through online mode. Online registrations for UPPSCL Technician Vacancy had taken place on 01.04.2019. Applicants can apply till the last date i.e. 30.04.2019. Selection of the candidates will be done through written test. For more details, candidates must read the given details carefully. 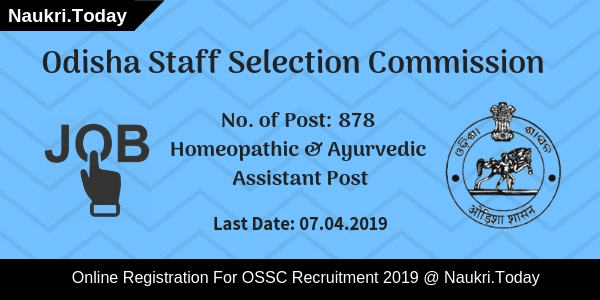 Fresh Update as on 27.03.2019: Uttar Pradesh PCL has relsaed notification for 4102 Technician (Line) Vacancies. Eligible candidates may apply online for UPPCL Recruitment 2019 from links given here. Check Eligibility Criteria details before filling up an application form for UPPCL Jobs 2019. The Last Date of Online Registration is 30.04.2019. What is the Required Age Criteria For UPPTCL Recruitment 2018? What is the Required Application Fee for Applying UPPCL Recruitment 2018 Online form ? What is the Important dates For UPPCL Technician Recruitment 2018 ? How I Check Required Application Fees, Pay Scale & Selection Criteria For UPPCL Technician Recruitment 2018 ? What is the required Application Fees For UPPCL Jobs 2018 ? How To Fill Online Form for UPPCL Recruitment 2018 – Uttar Pradesh PCL technician Jobs Online form ? What is the Closing Date for filling UPPCL Online form For Office Asst & Steno Jobs ? AM I Eligible For Applying Official Assistant Jobs Online form – Eligibility Criteria For UPPCL Recruitment 2017 – 18 ? What is the Age Criteria Required for UPPCL Recruitment 2017 – 18 ? How I Check Application Fees, Pay Scale & Selection Criteria For UPPCL Vacancies 2017 ? How Much Fees Should be paid for applying UPPCL Online Form ? What is the Selection Criteria/ Exam Procedure for UPPCL कार्यालय सहायक Vacancies ? How I Fill Online Form For UPPCL Recruitment 2017 – 18 For Office Asst & Steno Jobs ? Applicants must have qualify 10th class with science from any recognized board. NCVT or SCVT Certificate in restive field. Maximum: Rs. 86100/- of Matrix level 4 & Other Allowances will also be provided. Is It Necessary To Send Hard Copy Of UPPCL Recruitment Application Form 2019? Applicants are not require to send hard copy of registration form. But candidate can take print out of application form & keep it with them if it is require for any future reference. How To Apply Online For Uttar Pradesh PCL Vacancy 2019? Then go to home page & click on UPPCL Jobs notification 2019. Interested & eligible candidates can fill application form. Fill all the details in online form. Upload your passport size image & signature in UPPCL Vacancy Form. Recheck all details filled by you. Make payment of registration fee. Conclusion: UPPCL Recruitment 2019 notification is available for 4102 Technician (Line) Jobs. Applicants can submit their forms before last date i.e. 30.04.2019. 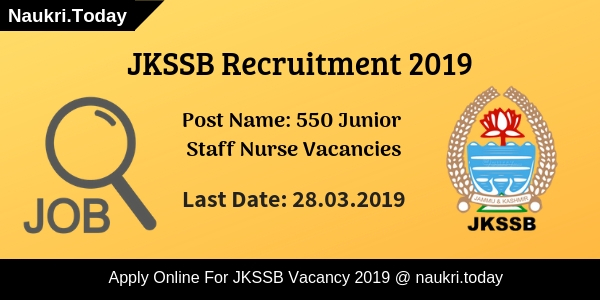 For more details, candidates can read the given above information. Dear Applicants, UPPCL is inviting online form for recruiting candidates on 299 Assistant Engineer Vacancy under Uttar Pradesh PCL & PTCL Department. Interested Candidates can fill online form for UPPCL Recruitment 2018 for Assistant Engineer Vacancy from here before the last date of Registration. Closing Date of submitting online form for UPPCL AE Vacancy is 30.11.2018. To get more details about Education Qualification, Age Criteria, Pay Scale for UPPTCL Recruitment is mention below. Uttar Pradesh Power Corporation Limited has issued Recruitment notification of 299 Assistant Engineer vacancy. All the Job Seeker who are looking for UPPCL Jobs Notification this is great chance to fill an online form. Submission of application form for UPPCL AE Recruitment will be started from 06.11.2018. Appliers must check required Eligibility Criteria From here & also Check more information by reading the given article. Name of the UPPCL Jobs : Assistant Engineer (Trainee) Jobs. Candidates you can check Department & Category wise Division of UP Power Corporation Vacancy in the below section. we are describing both UPPCL & UPPTCL Vacancies in the below para. Participant who are interested in Uttar Pradesh PCL Vacancy should check required Eligibility Criteria before applying online form. UIN the below section you can get full information about UPTRANSO AE Vacancy Qualification & Other details. Candidates must have done Engineering in relevant or equivalent qualification from any recognized university. Applicants must read official UPPCL Notification 2018 for further more details. Age of the candidates for UPPCL Recruitment 2018 must be in between 21 years to 40 years as on 01.07.2018. relaxation in age for UPPCL AE Vacancy is applicable only for SC/ST & OBC Category candidate of Uttar Pradesh State for UPPTCL AE Vacancy 2018. Candidates who will get selected for UPPCL Assistant Engineer Jobs 2018, pay band as per organization norms. At Starting, candidates will paid Rs. 56,100 with grade pay for UP Power Corporation Vacancy 2018. Candidates will be selected for UPPCL Recruitment 2018 on the basis of Written Examination (CBT) and Interview. Merit list of selected candidates will be prepared on the basis of Marks obtained in Written Examination & Interview. Final selection will be made after Documents Verification. To get more details to check the official notification & Keep in touch with this page for more updates. Participant can fill online form for UPPTCL Recruitment for Assistant Engineer Jobs from here before the closing date. Here we are providing step by step process of applying form for Uttar Pradesh PCL Vacancy 2018. Read the Steps properly & then click on Applying UPPCL Jobs Online form. First of all, candidates visit to the official website www.uppcl.org. Now click on the Vacancy/ result Section. Than click on Official UPPCL AE Recruitment Notification link. Fill Application fee & click on submit button. Conclusion : UPPCL Recruitment 2018 is available for 299 AE Vacancy. Apply Online form for UPPCL Vacancy on or before the last date 30.11.2018. To get more details read the above Article properly. Dear Applicants, Uttar Pradesh Power Corporation Limited has now issued notification for recruiting candidates on 2779 Technician Grade II Vacancies. All the applicants who are waiting for UPPCL Technician Jobs Notification this is a great job opportunity for them,. Interested candidates can fill online form for UPPCL Recruitment 2018 on or before the last date from here. Closing Date of filling online form for UPPCL Vacancy is 13.03.2018. More Information about About Uttar Pradesh PCL Recruitment you can collect from below article. UPPCL Is inviting online application for filing up Technician Grade 2 Vacancies. Online registration for UPPCL Jobs will started from 21.02.2018. Interested candidates must check required eligibility criteria before filling UPPCL Online Application. All the job seeker who are searching job in Uttar Pradesh state this is a golden opportunity for them. Rest of details like Age criteria, education, Pay Scale, Fees & Selection criteria mention here. Department & category wise division of UPPCL Jobs is mention here. applicants can also check this division from official Uttar Pradesh PCL Recruitment Notification 2018. Candidates can check port wise required Education & Age Criteria For UPPCL Vacancy you can check from here. Our naukri.today team is providing full details about Eligibility Criteria For UPPCL Technician Jobs 2018. Candidates must have passed High School or higher qualification from any recognized board. Candidates must have hold NCVY/SCVY Certificate in Electrician/ Electrician Trade from any recognized institute for UPPCL Technician Recruitment. Minimum age of the candidates for UPPCL Technician Grade 2 Jobs must be 18 years & Upper age must be 40 years as on 01.01.2018. Age relaxation is applicable for SC/ST/OBC/ Exam candidates of Uttar Pradesh State For UP Power Corporation Jobs. Selected candidates will paid a good salary as per organization norms. After selection candidates will paid Rs. 27,200/- to 66,100/- per month for UPPCL Recruitment 2018. SC/ST category candidates must paid Rs. 600/- as application fees for UPPCL Technician Online Form. Other Category candidates must paid Rs. 900/- for filling online form for Uttar Pradesh PCL Jobs 2018. Fees must be deposited through Credit/Debit card or SBI Challan. Selection of the candidates for UPPCL technician Vacancies will made on the basis of CBT Examination. Written Exam will divided into two parts. Pattern of Examination is mention here. More information about Examination you can check from official UPPCL Technician Jobs Notification. Interested & Eligible candidates for UPPCL vacancy 2018 can fill online form here till the last date 13.03.2018. Read & Follow the given steps which is helpful for filling online form for Uttar Pradesh PCL Recruitment 2018. First of all candidates log on the official website www.uppcl.org. Now click on Career Section & Click on UPPCL Technician Notification. Upload your scanned passport size photo &signature in form. Now deposit application fee for UPPCL Jobs 2018. Recheck all details before submission UPPCL Online form. Conclusion : – UPPCL Recruitment 2018 For 2779 Technician Vacancies. Candidates can fill online form for UPPCL Vacancies on or before the last date 13.03.2018. Check More information about Uttar Pradesh PCL Vacancies from here or from official notification. Applicants If you are waiting for UPPCL Upcoming Vacancy Notification, then here is a good news for you. 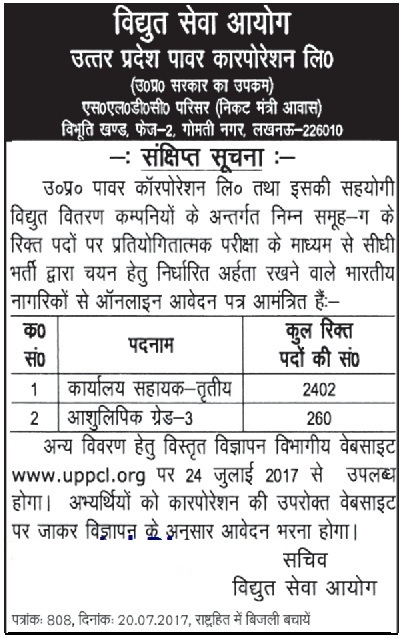 Uttar Pradesh Power Corporation Limited has published Revised advertisement of 2523 Office Asst & Stenographer Grade III Vacancies. All the Graduate Candidates who are searching Uttar Pradesh Vidyut Vibhag Vacancies can apply application form for UPPCL Recruitment 2017 – 18. Interested candidates can submit application form for UPPCL Vacancy through online mode from here. Closing date for applying UP Power Corporation Online form is 29th December 2017. Office Assistant Post : Candidates must have done Graduation Degree in any stream from any recognized University & Having knowledge of Hindi Typing on Computer (30 WPM) which is necessary. For Stenographer Jobs : Graduation Degree is required for applying UPPCL Stenographer Jobs Online form. Applicants must have Knowledge of हिंदी टंकण (30WPM) & हिंदी आशुलेखन (80WPM) for Steno Vacancy. Age of the Candidates for UP Power Corporation Recruitment 2017 should be in between 21 years to 40 years as on 01.07.2016. Age relaxation for UPPCL Office Assistant Recruitment 2017 will applicable on the basis of Depart Rules & regulation. After Selection of Qualified Candidates for UPPCL Vacancy 2017, Department will pay pay band as per Organization Norms. At joining time, Candidates will paid pay band Rs. 5,200/- to 20,200/- with Grade Pay Rs. 2,600/- for Office Asst & Steno Jobs . Applicants who are belonging from General/OBC(NCL)/ ESM/ Freedom Fighter Dependent candidates need to pay Rs. 1000/- as Application fee for UPPCL Jobs. Other than this Candidates of SC/ST Category must paid Rs. 700/- & PWD candidates need to pay Rs. 10/- for applying online application for UP Power Corporation Recruitment 2017. Selection of the candidates for UPPCL Recruitment 2017 – 18 will based on Written Examination, Tying & Stenography Test. Examination will divided into three parts (I, II & III). In part I Examination, Computer Knowledge Question of CCC Level Question will presented. Total 50 Question of 50 Marks will available in Part i Examination. After That candidates call for Part II examination which pattern is shown below. You can also check brief information about Examination by the help of UPPCL Syllabus 2017. Final Selection will made after Typing & steno Test. 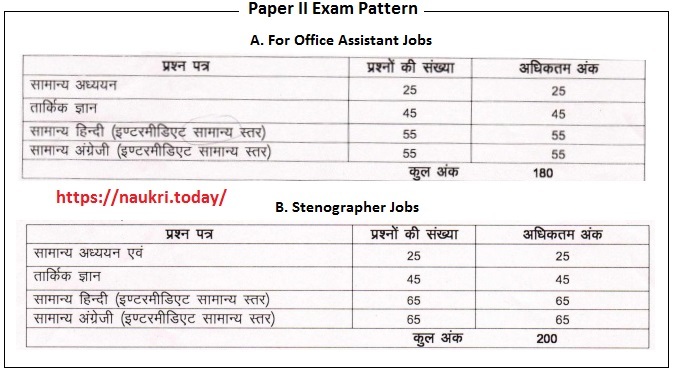 For Stenographer Vacancy Steno Test or Hindi Aashulekan exam will conduct. Merit list will prepared on the basis of marks obtain in examination. Before Examination Department will released UPPCL Admit Card on official website or through email ID. For more information about Exam & Other you can check from here. Keep in touch with this page for more updates about UPPCL Jobs 2017. Candidates visit to the official website www.uppcl.org. Now click on UPPCL Vacancy Section & Read all the information from notification properly. Make all the required information in form carefully without any mistake. Now deposit application fee before submission. Then click on submit online form for Office Asst Jobs. Take print out of UPPCL Online form for future use & Note Down ID Password For Future Use. Conclusion : UPPCL Recruitment 2017 – 18 for 2523 Office Assistant & Stenographer Jobs. Candidates can fill online form for UP Power Corporation recruitment 2017 on or before the closing date 29.12.2017.
sir, i filled the uppcl office assistant form on january 2017, but sir i forgot my user id and password so what should i do to get it back?? Office assistant grade -3 ka form bharoon? Please sir jaldi jawab dein.